A lot of developers try their hand at MMO games with mixed results; either something goes wrong with the gameplay or the online integration doesn't work as expected. However, with Game of War: Fire Age, Machine Zone manages to get it mostly right. 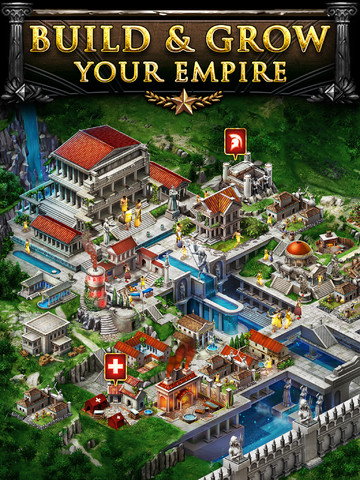 The game blends elements of Civilization with elements from the early Warcraft games, with the opportunity to build a nation from scratch while creating an army that can proudly defend it. At first, the game starts out simple, providing you automatic protection as you bring your city up to stature. However, once the protective gates rise, the options really open up. You'll need to form alliances within Game of War, teaming up with other countries and sharing resources and supplies. These aren't always the most trustworthy agreements - sometimes their king will attempt to overtake yours in the name of leadership. However, a good Alliance is nice to have, especially when you're crushing a rogue country under your boot, making them pay for dastardly deeds and displaying true power. With Game of War, though, it takes a while to get there. Like the best MMOs, or "grind-fests," it takes time and perhaps money to build a nation. Don't expect to jump in and have your ideal kingdom in minutes. Thankfully, the investment is worth it. Machine Zone has a great gameplay system where it's relatively easy to select your resources and take your kingdom and soldier to new heights. Crafting new weapons is a delight, as you can see how they take effect in the game's real-time battles. The scope of these battles is impressive, especially if you're a fan of epic fights. Some more intimate one-on-one encounters for leadership would've been nice, but the game does fine without them. Game of War looks good. You can see how your kingdom's growth is coming along, while keeping an eye open for neighboring allies - or enemies - with ease. However, this game is best played on an iPad, as it may be too hard to navigate on a tinier iPhone screen. Another thing that got our attention is Machine Zone's new chat system. Using this, you have the ability to send texts and chat online with your fellow Alliance members. 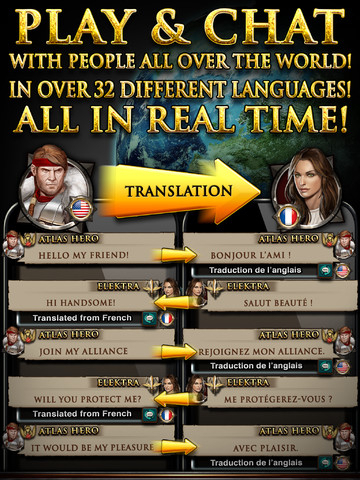 What's more, it's compatible worldwide, with the chat translating in real time across countries. It's not 100 percent - sometimes dialogue can be off - but it's still neat. If you're not crazy about MMO titles, Game of War: Fire Age won't change your mind. It's a real grind to build something of significance, and even then, it can be frustrating against an overpowered Alliance. For fans of the genre, though, this should be downloaded immediately. All hail to the King, however long he lasts, anyway. What's Hot:Well-implemented battle and world-building system, forming Alliances and crushing rogue countries, unique social system translates chat from around the world. What's Not:It will take some time to establish your nation and character, chat system isn't 100 percent free of dialogue errors, building a good army costs money.